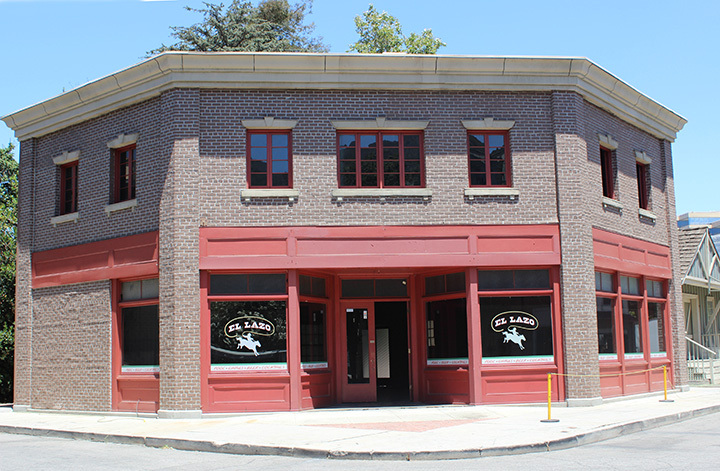 The Warner Bros. studio has occupied 142 acres in Burbank for almost 90 years. Film classics from Casablanca to The Maltese Falcon to Ocean’s Eleven to Inception have all been filmed on the studio’s stages and streets, which are open to tourists. The latest addition opens tomorrow—the coffee shop set from La La Land. Visitors on the WB studio tour board a mini tram and get to see the prop house, a garage full of Batmobiles, and maybe even Ellen Degeneres, who has been filming her show on the lot for the last 14 years. Now, guests can also linger at the reconstructed coffee shop Emma Stone’s character worked at in La La Land—though your visit will be limited to 15 minutes (which is long enough for a couple song and dance numbers). The French Street set has been recycled endless times since it was built in 1937. It hosted a Paris street festival in Phantom of the Rue Morgue, was transformed into a used car lot in The Omega Man, and became a Vietnamese village in The Green Berets. The street has been redressed multiple times since Emma Stone and Ryan Gosling shot there in August, 2015, but—for the sake of the tour—it’s been returned to the way it appeared in La La Land. “It was reconstructed exactly the same,” says WB representative Carly Yates. “It did not look like this yesterday morning.” For the tour, the studio painted the walls back to “celery,” brought in all the original props and décor, and is even offering snacks. “There are coffee and pastries and muffins right when you get on the cart,” says Carly Yates. “And we have croissants all over the lot.” Be on the lookout for young couples breaking into song.